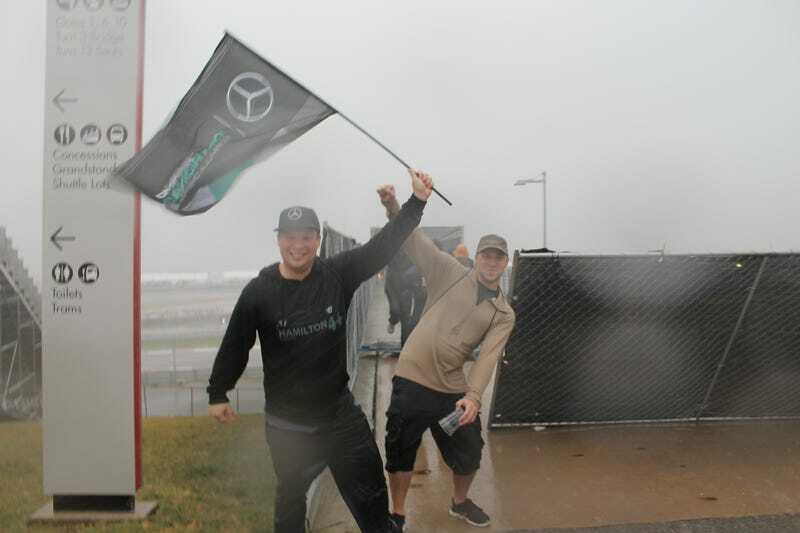 This pair of Mercedes Formula One fans didn’t care about the insane rain storm that flooded out and postponed Free Practice 2 at Circuit of the Americas indefinitely, nor did they care that half the fencing on the bridge behind them had blown over. They flew that Mercedes flag all the way back. Here’s some scenes of the carnage Mother Nature inflicted on COTA this afternoon. I am soaked from head to toe, but hey—I’m hiding in the paddock with all the Porsche Supercup cars, so I’m not leaving until they call the whole day off. Now that’s dedication to the cause.